More Details and Updated information can be found at my dedicated Swarovski Library or go directly to the Swarovski Zipper-Puller section. 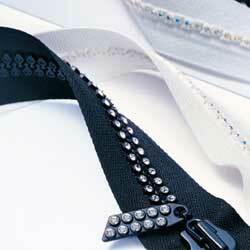 These Swarovski zippers come in white, black, and black and white fabric. In addition to these remarkable, eye-catching range, are also various types of zipper pullers which, as part of their beauty and verstaility, can also be used as phone and bag tags, as well as delightfully unusual and striking components in jewelry making. We will collect a list of product items here for your easy reference. They will be sorted by their Codes. Not every item has a name but when they do, we will include it. Click on the code-link for more details of each item..